3 teams are representing the North American League of legends pro-league, the NA LCS, at the LoL World Championship 2015. There are 3 different ways for the NA teams to earn a place at Worlds. They can earn the most ‘Championship Points’, which are acquired through performance across the LCS spring and summer split playoffs. Then there’s the 2 other options that come with a difficult fight ahead, the Playoffs tournament and the Regional qualifier tournament. The playoff tournament is held between the top 6 teams from the recent NA LCS Summer split, with each match being a best of 5 series the teams have to show that they’ve got what it takes to proceed to the next round and eventually making it to the finals to earn their place at the World Championship. The last one on the list is for the final top 4 teams that acquired the most championship points, that haven’t already qualified from the other 2 methods, to face off in a ‘gauntlet’ of best of 5 matches. This is where teams have to take their final opportunity to show what they’re made of and to take the final seed to the World Championship. For North America the 3 teams that qualified were Counter Logic Gaming (CLG) who took the first seed by winning the NA LCS Summer Playoffs tournament at the end of the summer split. The 2nd seed was earned by Team Solo Mid (TSM) who, after many difficult encounters, earned the most Championship Points across NA LCS season 5. The 3rd and final seed was acquired by Cloud9 (C9), through much hardship and teamwork they managed to beat the odds and take their place at the World Championship by defeating all other teams in the Regionals tournament. Counter Logic Gaming managed qualify for the World Championship as the No. 1 seed from North America. It wasn’t an easy task either, they had to overcome their long term rivals Team Solo mid. These 2 teams have quite an extensive history as rivals because both of these 2 teams have been competing for the top North American spot since the birth of the North American League of Legends competitive scene. Team Solo Mid managed to win 6 out of 8 games during the Playoff tournament before facing against CLG. Dropping only 1 loss per series they played in. This was already looking to be a difficult task for CLG as they already held a negative record against TSM, having always had a difficult time beating them in the past. However with great confidence and phenomenal play CLG managed to come out on top of TSM with a staggering 3:0 victory. This was shocking to everyone, possibly even the CLG players, because TSM had been such a dominant force in the past. After taking their victories during the Playoff tournament, against Team Impulse in the Semi-finals and TSM in the finals, CLG managed to earn their No.1 seed, something they had never achieved before. After years of competitive gaming this was considered, by the masses, to be CLGs first every meaningful victory. If Counter Logic Gaming can continue in this manner they will have an impact on the 2015 World Championship for sure. Achievements: 1st place NA LCS Spring Playoff 2015, 5/8th place World Championship 2014, 1st place IEM IX World Championship – Katowice 2015. Team Solo Mid recently started having a harder time against the top teams in North America; however with great performance during the spring split they managed to acquire 90 Championship points. With those points combined with the 90 points they were awarded after taking second place in the Summer Playoff tournament they were the team that held the most, granting them a seed to the world championship. You might be confused by me saying they are having trouble against the top teams currently. Statistically they’re still a top team but with their current decline in consistency they only managed to win 11 out of a total 18 games in the summer split, managing to take 5th place, in comparison to their 1st place in the spring split. With their performances at the end of summer being lacklustre at best they’re not looking like the strongest team. This was solidified when they managed to lose to CLG 0:3 in the playoff finals, this was a best of 5 series that every LCS fan was looking forward to. The rivalry between these 2 teams and their owners, Hotshotgg and Reginald who used to be team colleagues in the earlier competitive LoL scene, brought tremendous hype to the CLG and TSM games and have done for years. However their performance during the series was abysmal, maybe they were on tilt? If that really were the case then surely they would have had a better performance than Cloud 9 when facing off against Team Liquid. They may be on a decline but their efforts and their outcomes are still glorious. Team Solo Mid is the only team to have made it to the World Championship every single year since its inception, being one of the greatest achievements any team could have made up to this point in League of Legends history. So will TSM have wonnered Worlds 2015? A good question! With all of their previous experience against international teams I think, if they boot camped properly and improved their coaching staff, they could make an impact at the World Championship, especially with their imported talent on the team giving them an edge. Cloud9 have suffered a great deal, having a shaky start at the beginning of the season, where they were having trouble during the spring split. Through hardship they stuck it out and managed to end the split in 2nd place, with as many wins as the 1st place team TSM. This wasn’t the hardest part for them recently though. During the spring playoffs C9 were having trouble against teams they should have been able to clean up, they dropped 2 games to Team Liquid but brought the series back with a 3win streak. During the finals they had an extremely lacklustre performance against TSM where they lost 1:3. This wasn’t exactly the hyped up finals people were expecting! But shortly after the finals Cloud 9’s mid-laner, at the time, Hai “Hai” Du Lam announced his retirement due to wrist difficulties. He’d been playing with an injury and even though his performance in the previous few weeks wasn’t bad it was far from his A-game. After the retirement of Hai, Cloud9 picked up a mid-lane Nicolaj “Incarnati0n” Jensen. Incarnati0n, at the time, was a well-known European high-Elo superstar who was also known to have extremely toxic behaviour. During the early months of 2013 Incarnati0n was banned from participating in any Riot affiliated events however this was lifted as he managed to go a long period of time with outstanding behaviour and showed great improvement. Once the summer split has started, with the loss of their shot-caller, Cloud9 were having an extremely difficult time against all of the other teams. Whilst on the brink of being relegated to the Challenger Series their Jungler William “Meteos” Hartman willingly stepped down and was replaced by their ex mid-laner Hai. With Hai shot-calling once against for the team they managed to claim victories over TSM and most importantly Team8, this kept them just out of relegations and granted them 7th place at the end of the summer split. With their high placement during the spring split they secured a place in the NA LCS Regional Qualifiers 2015, where the hope of every Cloud9 fan bloomed as Cloud9 showed multiple glorious performances. The first best of 5 series they had during the Regional Qualifier tournament they had to face-off against Gravity Gaming, who were one of the top teams at the time. During this series C9 had an extremely shaky start, losing the first 2 games of the series. If they had lost just 1 more game they’d have been out of the tournament and lost their chance at making it to the World Championship. Once game 3 had begun every fan was looking at Cloud9 to pull out a miracle. They managed to take game 3 with decisive play and great shot-calling, working their way back and eventually claiming the series victory as they reverse sweep Gravity and win 3:2. The next team they had to face was Team Impulse, a team built from players of great individual skill. Once against they lost the first 2 games only it looked much worse for them because TIP are a relentless team who managed to make the first 2 games look easy. Once the third game arrived Coud9 pulled out a few picks that they were more comfortable on and they showed phenomenal play taking their first win of the series. Continuing their picking of comfortable champions their Marksman Zachery “Sneaky” Scuderi showed phenomenal mechanical play on the champion Vayne. Taking their second victory of the series and having it tied, this was achieved by their outstanding shot-calling and managing to punish TIP’s lack of team fighting, which eventually lead to their third victory. Taking another reverse sweep off of a team that most viewers assumed would dominate them. Through many hardships Cloud9 stood strong and made it to the finals of the Regional Qualifiers. 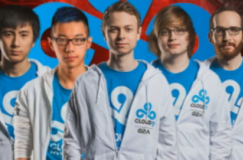 It was at this point that even fans doubted C9’s chances. Team Liquid were a much more consistent team who managed to take 1st place during the summer split, with twice as many wins and less than half the losses of Cloud 9. C9 went into the series with their heads held high saying “If we don’t win the series and regionals then we don’t deserve to play at worlds”. During the first game TL managed to take an early lead but with a few miss-steps Cloud9 manage to take a gold lead and a baron, allowing them to take the first victory. The second game was much more decisive with Team Liquid showing the strength that they had shown throughout the entirety of the summer split, they took an early lead and managed to punish every move that Cloud9 tried to make. This was just the start of the series and Cloud9 had a lot more to show the world. As the series continued Cloud9 improved and adapted, allowing them to punish TL for any miss-step. This showed during game 3 as they managed to claw their way back from having both a gold and kill deficit whilst also taking baron. Post 50mins in and Cloud9 steer the game to their victory. With only 1 more victory needed to win the tournament and take their place at the World Championship fans are on the edge of their seats. Cloud9 held a lead for the majority of the game but TL took a sneaky baron that helped them hold out the game. This didn’t shake C9’s dreams for Worlds as they took the final victory by picking off the TL team members and destroying their nexus by 41mins. Through hell and high water Cloud9 managed to pull off 2 reverse sweeps and then manage to take down the summer split 1st place team. Going into the tournament as underdogs and coming out on top. They showed outstanding ability to adapt to their enemies and punish them for even the slightest miss-play. They might not look like the strongest team at the moment but if we’ve learned anything from watching the Regional Qualifiers tournament it’s that you shouldn’t underestimate Cloud9 and their ability to perform when it’s needed. Because of all of the trouble and hardship that they faced, Casters and fans have deemed Cloud9’s run through the gauntlet a “Cinderella” run because they managed to achieve much more success than anyone, including myself, had given them credit for. CLG showed great improvement and strength nearing the end of the season and TSM have always managed to perform moderately well during the World Championship, because of these factors I think both of these teams will make it between 5-8th place but an upset is always possible. Cloud9 however have not shown as much consistent strength and I think this’ll get punished by the teams on the World Championship stage. However I’m done with underestimating this team and I’d like to believe they could push and take some wins out of the group stage and take the 12th or 13th place, depending on what group they’re drawn into they might even be able to push it further. NA LCS team overview by Addam ‘Canvas’ Burrows, English Literature and Journalism student of 2013. Diamond League Marksman. Contact Addam ‘ Canvas’ Burrows on Twitter!